I never knew they had harness racing in Argentina! A 3-year-old son of Shadow Play was victorious in the elimination and final of the Nacional Cup at the Hipodromo de Cintra in Cordoba province, Argentina. Check out his pedigree here, and he doesn’t have any of the Shadow Wave / Adios double ups that I mentioned in a previous blog, but his maternal line is quite a classic of course with Lismore sitting there on the very bottom line. Congratulations to Harness Racing New Zealand – they have split the Harness Racing Weekly into (1) a more user focused update and (2) a monthly glossy magazine with great production values along the lines of Hoofbeats. In the monthly magazine called “Harnessed” there is a section that focuses on breeders’ issues and news, and that has more or less taken over from Breeding Matters (and again that will be a more user focused information newsletter). I will have a regular article in the new magazine, which will start by looking back at some good races 10 and 20 years ago, and see what has happened to the breeding careers of the fillies and mares who featured in them. The first issue of Harnessed magazine excited me because it presents harness racing in a very professional way, and with a range of articles that even the casual supporter would find “a good read”. With over 100 pages, it is much more than a quick flick. The subscription rates are available here but I would suggest like most magazines the online sub is the best option if you are not someone who wants the handle the very professional magazine itself. Well done to all those involved, including HRNZ and the NZSBA for launching this industry flagship. NSW’s Richard Prior has been a b4breeding blog follower for some time, and a thoughtful breeder for much longer than that. 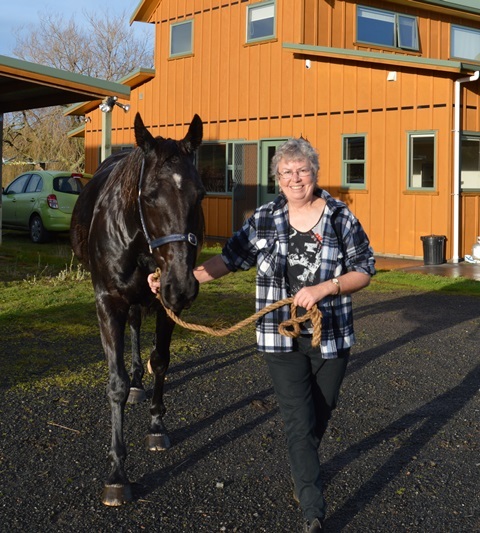 So when a horse he bred, Intransit, started to show up with a string of wins, I asked him to share the story through my blog. 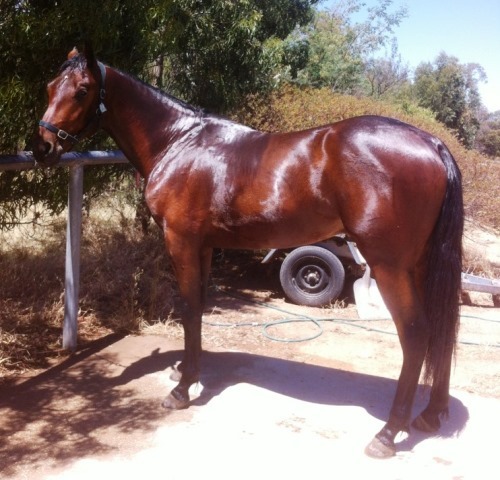 The giant (16.3h) gelding Intransit has had 13 starts for 6 wins, 3 seconds and $21,928 to date, most recently a string of good form at Mildura for new owners in Shayne Cramp’s training stable. I noticed an Artiscape mare in foal to Pacific Fella a few years ago. I initally passed as I’m no fan of Pacific Fella. The mare, Valley Whisper is pretty well bred as her mother Make An Impression is a ½ sister to Impressionist ($427,005), but had left nothing in the barn to Meadow Skipper/No Nukes line stallions and I really thought that with Valley Whisper being by an Adios line stallion, I could possibly straighten out the pedigree if I sent her to another suitable Adios line stallion. 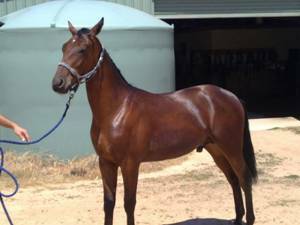 After I purchased the mare, the previous owner was playing funny buggers and was very slow weaning the Pacific Fella filly off the mare, so I ended up buying the filly as well. I had Valley Whisper and the filly shipped across from WA to SA as the horses were located at my sisters place in the Clare Valley . I later recovered the extra expense that I outlayed for the filly and I now had a mare that cost $300. The previous season I had lost a day old Sealed N Delivered filly. So Sealed N Delivered was the stallion of choice for Valley Whisper and he was a little taller than his father, Falcon Seelster. [Bee’s note: Sealed N Delivered is by Falcon Seelster out of Dana L Almahurst, a Nihilator mare, the same cross as McArdle. He was a top 2yo performer and has stood both in USA and Australia). The pedigree looked pretty good on paper and another thing I liked was that the stallion and mare were both from the same greater maternal family, Dairy Maid. Now my mare’s family is a bit hit and miss, they can leave ordinary performers or very good ones, (Impressionist, Mount Eden to name a couple). 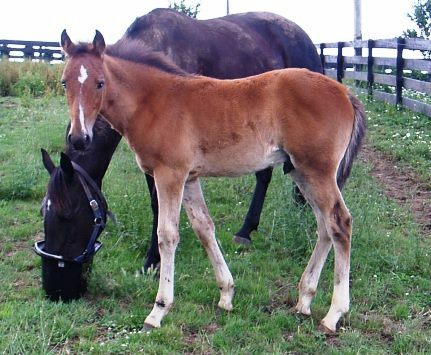 In the lead up to foaling our family were having bets on which mare (I had 3 in foal at the time) would leave a colt or a filly; we were all wrong, 3 colts and Intransit was the first, arriving at 4.00am on 01/11/10. He was a striking young horse from the very get go and I was totally overcome with joy at getting a colt from his young mother. Moving along a few months and circumstances had changed and I had to downsize and shift the young colts and a few broodmares to Victoria . My initial plan was to sell all 3 colts but only ended up selling one and Intransit just failed to reach his reserve, which was a real head shaker for me (it’s hard not to be bias but he would have been in the top 3 as a type in the sale) . Ian Montgomery had prepared the horses for the sales on short notice and performed a small miracle getting them looking so good. After the disappointing sale, I offered Ian a 50% share with the young Intransit and he did a wonderful job with the horse’s education. Now this horse has some tricks up his sleeve and the big one is his fear of the mobile, very strange for a horse that’s 16.3 hands to be scared of anything. After showing a bit of promise but still failing to score up properly and being put out of the draw, we decided to sell him to clients of Shayne Cramp’s and they would be over the moon as he’s won 5 from 7 starts at Mildura and with a little luck, would have won 7 in a row. He’s no superstar but the breeding has given me immense satisfaction. Zenterfold is such a character. She’s a 14yo mare but sometimes she acts like a teenager hooning around the paddock or having a tantrum when she couldn’t see Rosie, the old pony in the neighbour’s paddock. Other times she is the mature mare who had “been there, done that” and resents having any company she can’t boss around. With people she is a sweetheart, loves attention and carrots, and is the best mum to her foals which makes our lives a lot easier. This morning Kym was up early to get Zenterfold washed, “blow dried”, “pedicured” and loaded in the float. I still have to pinch myself that I have got a half-share in such a wonderful mare. She has delivered good looking foals that she stamps just as much as the sire, particularly in terms of temperament and competitive attitude. Zenterfold is due in late October, so she still has a couple of months – such important months for the foal – before then. 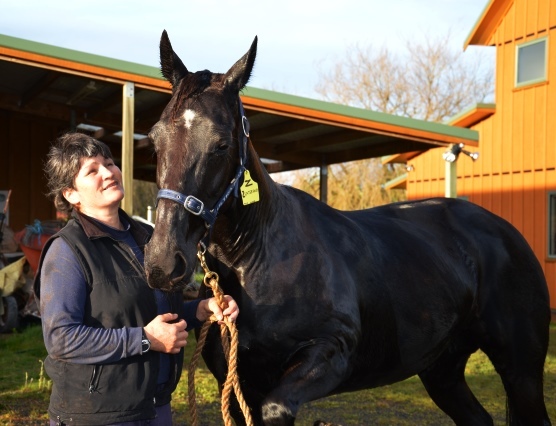 She is in familiar territory and familiar hands at Breckon Farms, where she always foals when she is down here in the Waikato. In future blogs I want to look at some of the other modern branches of Zenterfold’s wider family, where they are at now, and talk to the breeders, owners and trainers who are involved in their development. But for now, getting the mares to stud is a step to giving ourselves a break away from everything during September. They will be well looked after, and we can take a holiday from this wonderful passion and hobby as well as the “day jobs” that enable us to do it. 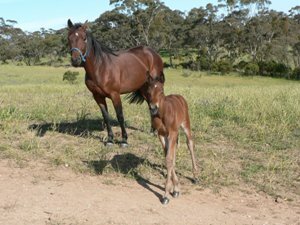 Blog readers will have followed the progress of The Blue Lotus’s brother Destination Moon from a foal (photo with mum Zenterfold) to a strapping yearling to a winning racehorse. He was sold to North America earlier this year, and has now made a modest but winning debut in a $14,000 race at Harrah’s Philadelphia track for owners Diamond Creek Racing, trainer Linda Toscano, and driver Tim Tetrick. For most of the race he was pocketed third back on the rail, but looked full of running, and when the horse on his outside dropped back he got space to pull out and easily catch and overhaul the two in front of him down the straight, winning by a good length or more. Overall time 1.52.2, last half in 55.3 and last quarter in 26.4. Good to know he has adapted to North America conditions.